For the journal, see Atherosclerosis (journal). Atherosclerosis is a disease in which the inside of an artery narrows due to the build up of plaque. Initially, there are generally no symptoms. When severe, it can result in coronary artery disease, stroke, peripheral artery disease, or kidney problems, depending on which arteries are affected. Symptoms, if they occur, generally do not begin until middle age. Prevention is generally by eating a healthy diet, exercising, not smoking, and maintaining a normal weight. Treatment of established disease may include medications to lower cholesterol such as statins, blood pressure medication, or medications that decrease clotting, such as aspirin. A number of procedures may also be carried out such as percutaneous coronary intervention, coronary artery bypass graft, or carotid endarterectomy. Atherosclerosis generally starts when a person is young and worsens with age. Almost all people are affected to some degree by the age of 65. It is the number one cause of death and disability in the developed world. Though it was first described in 1575, there is evidence that the condition occurred in people more than 5,000 years ago. The following terms are similar, yet distinct, in both spelling and meaning, and can be easily confused: arteriosclerosis, arteriolosclerosis, and atherosclerosis. Arteriosclerosis is a general term describing any hardening (and loss of elasticity) of medium or large arteries (from Greek, Modern ἀρτηρία (artēria), meaning 'artery', and σκλήρωσις (sklerosis), meaning 'hardening'); arteriolosclerosis is any hardening (and loss of elasticity) of arterioles (small arteries); atherosclerosis is a hardening of an artery specifically due to an atheromatous plaque (from Ancient Greek ἀθήρα (athḗra), meaning 'gruel'). The term atherogenic is used for substances or processes that cause formation of atheroma. Atherosclerosis is asymptomatic for decades because the arteries enlarge at all plaque locations, thus there is no effect on blood flow. Even most plaque ruptures do not produce symptoms until enough narrowing or closure of an artery, due to clots, occurs. Signs and symptoms only occur after severe narrowing or closure impedes blood flow to different organs enough to induce symptoms. Most of the time, patients realize that they have the disease only when they experience other cardiovascular disorders such as stroke or heart attack. These symptoms, however, still vary depending on which artery or organ is affected. Typically, atherosclerosis begins in childhood, as a thin layer of white-yellowish streaks with the inner layers of the artery walls (an accumulation of white blood cells, mostly monocytes/macrophages) and progresses from there. Clinically, given enlargement of the arteries for decades, symptomatic atherosclerosis is typically associated with men in their 40s and women in their 50s to 60s. Sub-clinically, the disease begins to appear in childhood, and rarely is already present at birth. Noticeable signs can begin developing at puberty. Though symptoms are rarely exhibited in children, early screening of children for cardiovascular diseases could be beneficial to both the child and his/her relatives. While coronary artery disease is more prevalent in men than women, atherosclerosis of the cerebral arteries and strokes equally affect both sexes. Marked narrowing in the coronary arteries, which are responsible for bringing oxygenated blood to the heart, can produce symptoms such as the chest pain of angina and shortness of breath, sweating, nausea, dizziness or light-headedness, breathlessness or palpitations. Abnormal heart rhythms called arrhythmias—the heart beating either too slowly or too quickly—are another consequence of ischemia. Carotid arteries supply blood to the brain and neck. Marked narrowing of the carotid arteries can present with symptoms such as a feeling of weakness, not being able to think straight, difficulty speaking, becoming dizzy and difficulty in walking or standing up straight, blurred vision, numbness of the face, arms, and legs, severe headache and losing consciousness. These symptoms are also related to stroke (death of brain cells). Stroke is caused by marked narrowing or closure of arteries going to the brain; lack of adequate blood supply leads to the death of the cells of the affected tissue. Peripheral arteries, which supply blood to the legs, arms, and pelvis, also experience marked narrowing due to plaque rupture and clots. Symptoms for the marked narrowing are numbness within the arms or legs, as well as pain. Another significant location for the plaque formation is the renal arteries, which supply blood to the kidneys. Plaque occurrence and accumulation leads to decreased kidney blood flow and chronic kidney disease, which, like all other areas, are typically asymptomatic until late stages. According to United States data for 2004, in about 66% of men and 47% of women, the first symptom of atherosclerotic cardiovascular disease is a heart attack or sudden cardiac death (death within one hour of onset of the symptom). Cardiac stress testing, traditionally the most commonly performed non-invasive testing method for blood flow limitations, in general, detects only lumen narrowing of ≈75% or greater, although some physicians claim that nuclear stress methods can detect as little as 50%. Case studies have included autopsies of U.S. soldiers killed in World War II and the Korean War. A much-cited report involved autopsies of 300 U.S. soldiers killed in Korea. Although the average age of the men was 22.1 years, 77.3 percent had "gross evidence of coronary arteriosclerosis". Other studies done of soldiers in the Vietnam War showed similar results, although often worse than the ones from the earlier wars. Theories include high rates of tobacco use and (in the case of the Vietnam soldiers) the advent of processed foods after World War II. The atherosclerotic process is not well understood. Atherosclerosis is associated with inflammatory processes in the endothelial cells of the vessel wall associated with retained low-density lipoprotein (LDL) particles. This retention may be a cause, an effect, or both, of the underlying inflammatory process. The presence of the plaque induces the muscle cells of the blood vessel to stretch, compensating for the additional bulk, and the endothelial lining thickens, increasing the separation between the plaque and lumen. This somewhat offsets the narrowing caused by the growth of the plaque, but it causes the wall to stiffen and become less compliant to stretching with each heart beat. The relation between dietary fat and atherosclerosis is controversial. Writing in Science, Gary Taubes detailed that political considerations played into the recommendations of government bodies. The USDA, in its food pyramid, promotes a diet of about 64% carbohydrates from total calories. The American Heart Association, the American Diabetes Association and the National Cholesterol Education Program make similar recommendations. In contrast, Prof Walter Willett (Harvard School of Public Health, PI of the second Nurses' Health Study) recommends much higher levels of fat, especially of monounsaturated and polyunsaturated fat. These dietary recommendations reach a consensus, though, against consumption of trans fats. The role of dietary oxidized fats/lipid peroxidation (rancid fats) in humans is not clear. Laboratory animals fed rancid fats develop atherosclerosis. Rats fed DHA-containing oils experienced marked disruptions to their antioxidant systems, and accumulated significant amounts of phospholipid hydroperoxide in their blood, livers and kidneys. Rabbits fed atherogenic diets containing various oils were found to undergo the greatest amount of oxidative susceptibility of LDL via polyunsaturated oils. In another study, rabbits fed heated soybean oil "grossly induced atherosclerosis and marked liver damage were histologically and clinically demonstrated." However, Fred Kummerow claims that it is not dietary cholesterol, but oxysterols, or oxidized cholesterols, from fried foods and smoking, that are the culprit. Rancid fats and oils taste very bad even in small amounts, so people avoid eating them. It is very difficult to measure or estimate the actual human consumption of these substances. Highly unsaturated omega-3 rich oils such as fish oil are being sold in pill form so that the taste of oxidized or rancid fat is not apparent. The health food industry's dietary supplements are self-regulated and outside of FDA regulations. To properly protect unsaturated fats from oxidation, it is best to keep them cool and in oxygen-free environments. Atherogenesis is the developmental process of atheromatous plaques. It is characterized by a remodeling of arteries leading to subendothelial accumulation of fatty substances called plaques. The buildup of an atheromatous plaque is a slow process, developed over a period of several years through a complex series of cellular events occurring within the arterial wall and in response to a variety of local vascular circulating factors. One recent hypothesis suggests that, for unknown reasons, leukocytes, such as monocytes or basophils, begin to attack the endothelium of the artery lumen in cardiac muscle. The ensuing inflammation leads to formation of atheromatous plaques in the arterial tunica intima, a region of the vessel wall located between the endothelium and the tunica media. The bulk of these lesions is made of excess fat, collagen, and elastin. At first, as the plaques grow, only wall thickening occurs without any narrowing. Stenosis is a late event, which may never occur and is often the result of repeated plaque rupture and healing responses, not just the atherosclerotic process by itself. 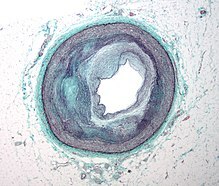 Micrograph of an artery that supplies the heart showing significant atherosclerosis and marked luminal narrowing. Tissue has been stained using Masson's trichrome. Early atherogenesis is characterized by the adherence of blood circulating monocytes (a type of white blood cell) to the vascular bed lining, the endothelium, then by their migration to the sub-endothelial space, and further activation into monocyte-derived macrophages. The primary documented driver of this process is oxidized lipoprotein particles within the wall, beneath the endothelial cells, though upper normal or elevated concentrations of blood glucose also plays a major role and not all factors are fully understood. Fatty streaks may appear and disappear. Low-density lipoprotein (LDL) particles in blood plasma invade the endothelium and become oxidized, creating risk of cardiovascular disease. A complex set of biochemical reactions regulates the oxidation of LDL, involving enzymes (such as Lp-LpA2) and free radicals in the endothelium. Initial damage to the endothelium results in an inflammatory response. Monocytes enter the artery wall from the bloodstream, with platelets adhering to the area of insult. This may be promoted by redox signaling induction of factors such as VCAM-1, which recruit circulating monocytes, and M-CSF, which is selectively required for the differentiation of monocytes to macrophages. The monocytes differentiate into macrophages, which proliferate locally, ingest oxidized LDL, slowly turning into large "foam cells" – so-called because of their changed appearance resulting from the numerous internal cytoplasmic vesicles and resulting high lipid content. Under the microscope, the lesion now appears as a fatty streak. Foam cells eventually die and further propagate the inflammatory process. In addition to these cellular activities, there is also smooth muscle proliferation and migration from the tunica media into the intima in response to cytokines secreted by damaged endothelial cells. This causes the formation of a fibrous capsule covering the fatty streak. Intact endothelium can prevent this smooth muscle proliferation by releasing nitric oxide. Calcification forms among vascular smooth muscle cells of the surrounding muscular layer, specifically in the muscle cells adjacent to atheromas and on the surface of atheroma plaques and tissue. In time, as cells die, this leads to extracellular calcium deposits between the muscular wall and outer portion of the atheromatous plaques. With the atheromatous plaque interfering with the regulation of the calcium deposition, it accumulates and crystallizes. A similar form of an intramural calcification, presenting the picture of an early phase of arteriosclerosis, appears to be induced by a number of drugs that have an antiproliferative mechanism of action (Rainer Liedtke 2008). Cholesterol is delivered into the vessel wall by cholesterol-containing low-density lipoprotein (LDL) particles. To attract and stimulate macrophages, the cholesterol must be released from the LDL particles and oxidized, a key step in the ongoing inflammatory process. The process is worsened if there is insufficient high-density lipoprotein (HDL), the lipoprotein particle that removes cholesterol from tissues and carries it back to the liver. The foam cells and platelets encourage the migration and proliferation of smooth muscle cells, which in turn ingest lipids, become replaced by collagen and transform into foam cells themselves. A protective fibrous cap normally forms between the fatty deposits and the artery lining (the intima). These capped fatty deposits (now called 'atheromas') produce enzymes that cause the artery to enlarge over time. As long as the artery enlarges sufficiently to compensate for the extra thickness of the atheroma, then no narrowing ("stenosis") of the opening ("lumen") occurs. The artery becomes expanded with an egg-shaped cross-section, still with a circular opening. If the enlargement is beyond proportion to the atheroma thickness, then an aneurysm is created. The fibro-lipid (fibro-fatty) plaque is characterized by an accumulation of lipid-laden cells underneath the intima of the arteries, typically without narrowing the lumen due to compensatory expansion of the bounding muscular layer of the artery wall. Beneath the endothelium there is a "fibrous cap" covering the atheromatous "core" of the plaque. The core consists of lipid-laden cells (macrophages and smooth muscle cells) with elevated tissue cholesterol and cholesterol ester content, fibrin, proteoglycans, collagen, elastin, and cellular debris. In advanced plaques, the central core of the plaque usually contains extracellular cholesterol deposits (released from dead cells), which form areas of cholesterol crystals with empty, needle-like clefts. At the periphery of the plaque are younger "foamy" cells and capillaries. These plaques usually produce the most damage to the individual when they rupture. Cholesterol crystals may also play a role. The fibrous plaque is also localized under the intima, within the wall of the artery resulting in thickening and expansion of the wall and, sometimes, spotty localized narrowing of the lumen with some atrophy of the muscular layer. The fibrous plaque contains collagen fibers (eosinophilic), precipitates of calcium (hematoxylinophilic) and, rarely, lipid-laden cells. In effect, the muscular portion of the artery wall forms small aneurysms just large enough to hold the atheroma that are present. The muscular portion of artery walls usually remain strong, even after they have remodeled to compensate for the atheromatous plaques. However, atheromas within the vessel wall are soft and fragile with little elasticity. Arteries constantly expand and contract with each heartbeat, i.e., the pulse. In addition, the calcification deposits between the outer portion of the atheroma and the muscular wall, as they progress, lead to a loss of elasticity and stiffening of the artery as a whole. The calcification deposits, after they have become sufficiently advanced, are partially visible on coronary artery computed tomography or electron beam tomography (EBT) as rings of increased radiographic density, forming halos around the outer edges of the atheromatous plaques, within the artery wall. On CT, >130 units on the Hounsfield scale (some argue for 90 units) has been the radiographic density usually accepted as clearly representing tissue calcification within arteries. These deposits demonstrate unequivocal evidence of the disease, relatively advanced, even though the lumen of the artery is often still normal by angiography. Progression of atherosclerosis to late complications. Although the disease process tends to be slowly progressive over decades, it usually remains asymptomatic until an atheroma ulcerates, which leads to immediate blood clotting at the site of atheroma ulcer. This triggers a cascade of events that leads to clot enlargement, which may quickly obstruct the flow of blood. A complete blockage leads to ischemia of the myocardial (heart) muscle and damage. This process is the myocardial infarction or "heart attack". If the heart attack is not fatal, fibrous organization of the clot within the lumen ensues, covering the rupture but also producing stenosis or closure of the lumen, or over time and after repeated ruptures, resulting in a persistent, usually localized stenosis or blockage of the artery lumen. Stenoses can be slowly progressive, whereas plaque ulceration is a sudden event that occurs specifically in atheromas with thinner/weaker fibrous caps that have become "unstable". Repeated plaque ruptures, ones not resulting in total lumen closure, combined with the clot patch over the rupture and healing response to stabilize the clot is the process that produces most stenoses over time. The stenotic areas tend to become more stable despite increased flow velocities at these narrowings. Most major blood-flow-stopping events occur at large plaques, which, prior to their rupture, produced very little if any stenosis. From clinical trials, 20% is the average stenosis at plaques that subsequently rupture with resulting complete artery closure. Most severe clinical events do not occur at plaques that produce high-grade stenosis. From clinical trials, only 14% of heart attacks occur from artery closure at plaques producing a 75% or greater stenosis prior to the vessel closing. If the fibrous cap separating a soft atheroma from the bloodstream within the artery ruptures, tissue fragments are exposed and released. These tissue fragments are very clot-promoting, containing collagen and tissue factor; they activate platelets and activate the system of coagulation. The result is the formation of a thrombus (blood clot) overlying the atheroma, which obstructs blood flow acutely. With the obstruction of blood flow, downstream tissues are starved of oxygen and nutrients. If this is the myocardium (heart muscle) angina (cardiac chest pain) or myocardial infarction (heart attack) develops. The distribution of atherosclerotic plaques in a part of arterial endothelium is inhomogeneous. The multiple and focal development of atherosclerotic changes is similar to that in the development of amyloid plaques in the brain and that of age spots on the skin. Misrepair-accumulation aging theory suggests that misrepair mechanisms play an important role in the focal development of atherosclerosis. Development of a plaque is a result of repair of injured endothelium. Because of the infusion of lipids into sub-endothelium, the repair has to end up with altered remodeling of local endothelium. This is the manifestation of a misrepair. Important is this altered remodeling makes the local endothelium have increased fragility to damage and have reduced repair-efficiency. As a consequence, this part of endothelium has increased risk to be injured and to be misrepaired. Thus, the accumulation of misrepairs of endothelium is focalized and self-accelerating. In this way, the growing of a plaque is also self-accelerating. Within a part of arterial wall, the oldest plaque is always the biggest, and is the most dangerous one to cause blockage of local artery. Calcification at the outer base of older or more advanced lesions. Atherosclerotic lesions, or atherosclerotic plaques, are separated into two broad categories: Stable and unstable (also called vulnerable). The pathobiology of atherosclerotic lesions is very complicated, but generally, stable atherosclerotic plaques, which tend to be asymptomatic, are rich in extracellular matrix and smooth muscle cells. On the other hand, unstable plaques are rich in macrophages and foam cells, and the extracellular matrix separating the lesion from the arterial lumen (also known as the fibrous cap) is usually weak and prone to rupture. Ruptures of the fibrous cap expose thrombogenic material, such as collagen, to the circulation and eventually induce thrombus formation in the lumen. Upon formation, intraluminal thrombi can occlude arteries outright (e.g., coronary occlusion), but more often they detach, move into the circulation, and eventually occlude smaller downstream branches causing thromboembolism. Apart from thromboembolism, chronically expanding atherosclerotic lesions can cause complete closure of the lumen. Chronically expanding lesions are often asymptomatic until lumen stenosis is so severe (usually over 80%) that blood supply to downstream tissue(s) is insufficient, resulting in ischemia. These complications of advanced atherosclerosis are chronic, slowly progressive and cumulative. Most commonly, soft plaque suddenly ruptures (see vulnerable plaque), causing the formation of a thrombus that will rapidly slow or stop blood flow, leading to death of the tissues fed by the artery in approximately five minutes. This event is called an infarction. Areas of severe narrowing, stenosis, detectable by angiography, and to a lesser extent "stress testing" have long been the focus of human diagnostic techniques for cardiovascular disease, in general. However, these methods focus on detecting only severe narrowing, not the underlying atherosclerosis disease. As demonstrated by human clinical studies, most severe events occur in locations with heavy plaque, yet little or no lumen narrowing present before debilitating events suddenly occur. Plaque rupture can lead to artery lumen occlusion within seconds to minutes, and potential permanent debility and sometimes sudden death. Plaques that have ruptured are called complicated plaques. The extracellular matrix of the lesion breaks, usually at the shoulder of the fibrous cap that separates the lesion from the arterial lumen, where the exposed thrombogenic components of the plaque, mainly collagen will trigger thrombus formation. The thrombus then travels downstream to other blood vessels, where the blood clot may partially or completely block blood flow. If the blood flow is completely blocked, cell deaths occur due to the lack of oxygen supply to nearby cells, resulting in necrosis. The narrowing or obstruction of blood flow can occur in any artery within the body. Obstruction of arteries supplying the heart muscle results in a heart attack, while the obstruction of arteries supplying the brain results in an ischaemic stroke. Lumen stenosis that is greater than 75% was considered the hallmark of clinically significant disease in the past because recurring episodes of angina and abnormalities in stress tests are only detectable at that particular severity of stenosis. However, clinical trials have shown that only about 14% of clinically debilitating events occur at sites with more than 75% stenosis. The majority of cardiovascular events that involve sudden rupture of the atheroma plaque do not display any evident narrowing of the lumen. Thus, greater attention has been focused on "vulnerable plaque" from the late 1990s onwards. Besides the traditional diagnostic methods such as angiography and stress-testing, other detection techniques have been developed in the past decades for earlier detection of atherosclerotic disease. Some of the detection approaches include anatomical detection and physiologic measurement. Examples of anatomical detection methods include coronary calcium scoring by CT, carotid IMT (intimal media thickness) measurement by ultrasound, and intravascular ultrasound (IVUS). Examples of physiologic measurement methods include lipoprotein subclass analysis, HbA1c, hs-CRP, and homocysteine. Both anatomic and physiologic methods allow early detection before symptoms show up, disease staging and tracking of disease progression. Anatomic methods are more expensive and some of them are invasive in nature, such as IVUS. On the other hand, physiologic methods are often less expensive and safer. But they do not quantify the current state of the disease or directly track progression. In recent years, developments in nuclear imaging techniques such as PET and SPECT have provided ways of estimating the severity of atherosclerotic plaques. Up to 90% of cardiovascular disease may be preventable if established risk factors are avoided. Medical management of atherosclerosis first involves modification to risk factors–for example, via smoking cessation and diet restrictions. Prevention then is generally by eating a healthy diet, exercising, not smoking, and maintaining a normal weight. Changes in diet may help prevent the development of atherosclerosis. Tentative evidence suggests that a diet containing dairy products has no effect on or decreases the risk of cardiovascular disease. A diet high in fruits and vegetables decreases the risk of cardiovascular disease and death. Evidence suggests that the Mediterranean diet may improve cardiovascular results. There is also evidence that a Mediterranean diet may be better than a low-fat diet in bringing about long-term changes to cardiovascular risk factors (e.g., lower cholesterol level and blood pressure). A controlled exercise program combats atherosclerosis by improving circulation and functionality of the vessels. Exercise is also used to manage weight in patients who are obese, lower blood pressure, and decrease cholesterol. Often lifestyle modification is combined with medication therapy. For example, statins help to lower cholesterol, antiplatelet medications like aspirin help to prevent clots, and a variety of antihypertensive medications are routinely used to control blood pressure. If the combined efforts of risk factor modification and medication therapy are not sufficient to control symptoms, or fight imminent threats of ischemic events, a physician may resort to interventional or surgical procedures to correct the obstruction. Treatment of established disease may include medications to lower cholesterol such as statins, blood pressure medication, or medications that decrease clotting, such as aspirin. A number of procedures may also be carried out such as percutaneous coronary intervention, coronary artery bypass graft, or carotid endarterectomy. Medical treatments often focus on alleviating symptoms. However measures which focus on decreasing underlying atherosclerosis—as opposed to simply treating symptoms—are more effective. Non-pharmaceutical means are usually the first method of treatment, such as stopping smoking and practicing regular exercise. If these methods do not work, medicines are usually the next step in treating cardiovascular diseases and, with improvements, have increasingly become the most effective method over the long term. The key to the more effective approaches is to combine multiple different treatment strategies. In addition, for those approaches, such as lipoprotein transport behaviors, which have been shown to produce the most success, adopting more aggressive combination treatment strategies taken on a daily basis and indefinitely has generally produced better results, both before and especially after people are symptomatic. The group of medications referred to as statins are widely prescribed for treating atherosclerosis. They have shown benefit in reducing cardiovascular disease and mortality in those with high cholesterol with few side effects. These data are primarily in middle-age men and the conclusions are less clear for women and people over the age of 70. When atherosclerosis has become severe and caused irreversible ischemia, such as tissue loss in the case of peripheral artery disease, surgery may be indicated. Vascular bypass surgery can re-establish flow around the diseased segment of artery, and angioplasty with or without stenting can reopen narrowed arteries and improve bloodflow. Coronary artery bypass grafting without manipulation of the ascending aorta has demonstrated reduced rates of postoperative stroke and mortality compared to traditional on-pump coronary revascularization. There is evidence that some anticoagulants, particularly warfarin, which inhibit clot formation by interfering with Vitamin K metabolism, may actually promote arterial calcification in the long term despite reducing clot formation in the short term. An indication of the role of HDL on atherosclerosis has been with the rare Apo-A1 Milano human genetic variant of this HDL protein. A small short-term trial using bacterial synthetized human Apo-A1 Milano HDL in people with unstable angina produced fairly dramatic reduction in measured coronary plaque volume in only six weeks vs. the usual increase in plaque volume in those randomized to placebo. The trial was published in JAMA in early 2006. Ongoing work starting in the 1990s may lead to human clinical trials—probably by about 2008. [needs update] These may use synthesized Apo-A1 Milano HDL directly, or they may use gene-transfer methods to pass the ability to synthesize the Apo-A1 Milano HDLipoprotein. Methods to increase high-density lipoprotein (HDL) particle concentrations, which in some animal studies largely reverses and remove atheromas, are being developed and researched. However, increasing HDL by any means is not necessarily helpful. For example, the drug torcetrapib is the most effective agent currently known for raising HDL (by up to 60%). However, in clinical trials it also raised deaths by 60%. All studies regarding this drug were halted in December 2006. See CETP inhibitor for similar approaches. 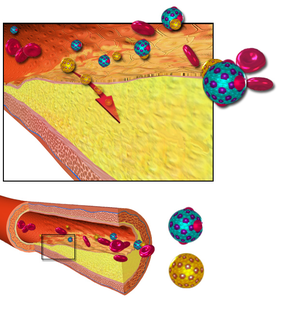 The actions of macrophages drive atherosclerotic plaque progression. Immunomodulation of atherosclerosis is the term for techniques that modulate immune system function to suppress this macrophage action. The multiple variants of the proteins that form the lipoprotein transport particles. Involvement of lipid peroxidation chain reaction in atherogenesis triggered research on the protective role of the heavy isotope (deuterated) polyunsaturated fatty acids (D-PUFAs) that are less prone to oxidation than ordinary PUFAs (H-PUFAs). PUFAs are essential nutrients – they are involved in metabolism in that very form as they are consumed with food. In transgenic mice, that are a model for human-like lipoprotein metabolism, adding D-PUFAs to diet indeed reduced body weight gain, improved cholesterol handling and reduced atherosclerotic damage to aorta. MicroRNAs (miRNAs) have complementary sequences in the 3' UTR and 5' UTR of target mRNAs of protein-coding genes, and cause mRNA cleavage or repression of translational machinery. In diseased vascular vessels, miRNAs are dysregulated and highly expressed. miR-33 is found in cardiovascular diseases. It is involved in atherosclerotic initiation and progression including lipid metabolism, insulin signaling and glucose homeostatis, cell type progression and proliferation, and myeloid cell differentiation. It was found in rodents that the inhibition of miR-33 will raise HDL level and the expression of miR-33 is down-regulated in humans with atherosclerotic plaques. miR-33a and miR-33b are located on intron 16 of human sterol regulatory element-binding protein 2 (SREBP2) gene on chromosome 22 and intron 17 of SREBP1 gene on chromosome 17. miR-33a/b regulates cholesterol/lipid homeostatis by binding in the 3’UTRs of genes involved in cholesterol transport such as ATP binding cassette (ABC) transporters and enhance or represses its expression. Study have shown that ABCA1 mediates transport of cholesterol from peripheral tissues to Apolipoprotein-1 and it is also important in the reverse cholesterol transport pathway, where cholesterol is delivered from peripheral tissue to the liver, where it can be excreted into bile or converted to bile acids prior to excretion. Therefore, we know that ABCA1 plays an important role in preventing cholesterol accumulation in macrophages. By enhancing miR-33 function, the level of ABCA1 is decreased, leading to decrease cellular cholesterol efflux to apoA-1. On the other hand, by inhibiting miR-33 function, the level of ABCA1 is increased and increases the cholesterol efflux to apoA-1. Suppression of miR-33 will lead to less cellular cholesterol and higher plasma HDL level through the regulation of ABCA1 expression. The sugar, cyclodextrin, removed cholesterol that had built up in the arteries of mice fed a high-fat diet. Aging is the most important risk factor for cardiovascular problems. The causative basis by which aging mediates its impact, independently of other recognized risk factors, remains to be determined. Evidence has been reviewed for a key role of DNA damage in vascular aging.8-oxoG, a common type of oxidative damage in DNA, is found to accumulate in plaque vascular smooth muscle cells, macrophages and endothelial cells, thus linking DNA damage to plaque formation. DNA strand breaks also increased in atherosclerotic plaques. Werner syndrome (WS) is a premature aging condition in humans. WS is caused by a genetic defect in a RecQ helicase that is employed in several repair processes that remove damages from DNA. WS patients develop a considerable burden of atherosclerotic plaques in their coronary arteries and aorta: calcification of the aortic valve is also frequently observed. These findings link excessive unrepaired DNA damage to premature aging and early atherosclerotic plaque development (see DNA damage theory of aging). The microbiota – all the microorganisms in the body, can contribute to atherosclerosis in many ways: modulation of the immune system, changes in metabolism, processing of nutrients and production of certain metabolites that can get into blood circulation. One such metabolite, produced by gut bacteria, is trimethylamine N-oxide (TMAO). Its levels have been associated with atherosclerosis in human studies and animal research suggest that there can be a causal relation. An association between the bacterial genes encoding trimethylamine lyases — the enzymes involved in TMAO generation — and atherosclerosis has been noted. In 2011, coronary atherosclerosis was one of the top ten most expensive conditions seen during inpatient hospitalizations in the US, with aggregate inpatient hospital costs of $10.4 billion. ^ a b c d e f "What Are the Signs and Symptoms of Atherosclerosis? - NHLBI, NIH". www.nhlbi.nih.gov. 22 June 2016. Retrieved 5 November 2017. ^ a b "What Causes Atherosclerosis? - NHLBI, NIH". www.nhlbi.nih.gov. 22 June 2016. Retrieved 6 November 2017. ^ a b c "Who Is at Risk for Atherosclerosis?". www.nhlbi.nih.gov. 22 June 2016. Retrieved 5 November 2017. ^ a b c "How Can Atherosclerosis Be Prevented or Delayed? - NHLBI, NIH". www.nhlbi.nih.gov. 22 June 2016. Retrieved 6 November 2017. ^ a b c d e "How Is Atherosclerosis Treated? - NHLBI, NIH". www.nhlbi.nih.gov. 22 June 2016. Retrieved 6 November 2017. ^ a b Aronow WS, Fleg JL, Rich MW (2013). Tresch and Aronow's Cardiovascular Disease in the Elderly, Fifth Edition. CRC Press. p. 171. ISBN 9781842145449. ^ a b c "What Is Atherosclerosis? - NHLBI, NIH". www.nhlbi.nih.gov. 22 June 2016. Retrieved 6 November 2017. ^ "How Is Atherosclerosis Diagnosed? - NHLBI, NIH". www.nhlbi.nih.gov. 22 June 2016. Retrieved 6 November 2017. ^ Topol EJ, Califf RM (2007). Textbook of Cardiovascular Medicine. Lippincott Williams & Wilkins. p. 2. ISBN 9780781770125. ^ a b Shor A (2008). Chlamydia Atherosclerosis Lesion: Discovery, Diagnosis and Treatment. Springer Science & Business Media. p. 8. ISBN 9781846288104. ^ Ross R (April 1993). "The pathogenesis of atherosclerosis: a perspective for the 1990s". Nature. 362 (6423): 801–9. Bibcode:1993Natur.362..801R. doi:10.1038/362801a0. PMID 8479518. ^ a b c "Atherosclerosis". National Heart, Lung and Blood Institute. 2011. ^ "First signs of atherosclerotic heart disease may appear in early childhood". News-Medical.net. ^ Flora GC, Baker AB, Loewenson RB, Klassen AC (November 1968). "A comparative study of cerebral atherosclerosis in males and females". Circulation. 38 (5): 859–69. doi:10.1161/01.CIR.38.5.859. PMID 5697685. ^ Sims NR, Muyderman H (January 2010). "Mitochondria, oxidative metabolism and cell death in stroke". Biochimica et Biophysica Acta. 1802 (1): 80–91. doi:10.1016/j.bbadis.2009.09.003. PMID 19751827. ^ Enos WF, Holmes RH, Beyer J (1953). "Coronary disease among United States soldiers killed in action in Korea: Preliminary Report". JAMA. 152 (12): 1090–93. doi:10.1001/jama.1953.03690120006002. The average age was calculated from the ages of 200 of the soldiers. No age was recorded in nearly 100 of the men. ^ Li X, Fang P, Li Y, Kuo YM, Andrews AJ, Nanayakkara G, Johnson C, Fu H, Shan H, Du F, Hoffman NE, Yu D, Eguchi S, Madesh M, Koch WJ, Sun J, Jiang X, Wang H, Yang X (June 2016). "Mitochondrial Reactive Oxygen Species Mediate Lysophosphatidylcholine-Induced Endothelial Cell Activation". Arteriosclerosis, Thrombosis, and Vascular Biology. 36 (6): 1090–100. doi:10.1161/ATVBAHA.115.306964. PMC 4882253. PMID 27127201. ^ Williams KJ, Tabas I (May 1995). "The response-to-retention hypothesis of early atherogenesis". Arteriosclerosis, Thrombosis, and Vascular Biology. 15 (5): 551–61. doi:10.1161/01.ATV.15.5.551. PMC 2924812. PMID 7749869. ^ Aviram M, Fuhrman B (November 1998). "LDL oxidation by arterial wall macrophages depends on the oxidative status in the lipoprotein and in the cells: role of prooxidants vs. antioxidants". Molecular and Cellular Biochemistry. 188 (1–2): 149–59. doi:10.1023/A:1006841011201. PMID 9823020. ^ Enas EA, Kuruvila A, Khanna P, Pitchumoni CS, Mohan V (October 2013). "Benefits & risks of statin therapy for primary prevention of cardiovascular disease in Asian Indians - a population with the highest risk of premature coronary artery disease & diabetes". The Indian Journal of Medical Research. 138 (4): 461–91. PMC 3868060. PMID 24434254. ^ Borissoff JI, Spronk HM, Heeneman S, ten Cate H (June 2009). "Is thrombin a key player in the 'coagulation-atherogenesis' maze?". Cardiovascular Research. 82 (3): 392–403. doi:10.1093/cvr/cvp066. PMID 19228706. ^ Borissoff JI, Heeneman S, Kilinç E, Kassák P, Van Oerle R, Winckers K, Govers-Riemslag JW, Hamulyák K, Hackeng TM, Daemen MJ, ten Cate H, Spronk HM (August 2010). "Early atherosclerosis exhibits an enhanced procoagulant state". Circulation. 122 (8): 821–30. doi:10.1161/CIRCULATIONAHA.109.907121. PMID 20697022. ^ Borissoff JI, Spronk HM, ten Cate H (May 2011). "The hemostatic system as a modulator of atherosclerosis". The New England Journal of Medicine. 364 (18): 1746–60. doi:10.1056/NEJMra1011670. PMID 21542745. ^ Food and nutrition board, institute of medicine of the national academies (2005). Dietary Reference Intakes for Energy, Carbohydrate, Fiber, Fat, Fatty Acids, Cholesterol, Protein, and Amino Acids (Macronutrients). National Academies Press. pp. 481–484. ^ Mozaffarian D, Rimm EB, Herrington DM (November 2004). "Dietary fats, carbohydrate, and progression of coronary atherosclerosis in postmenopausal women". The American Journal of Clinical Nutrition. 80 (5): 1175–84. doi:10.1093/ajcn/80.5.1175. PMC 1270002. PMID 15531663. ^ Bhatt DL, Topol EJ (July 2002). "Need to test the arterial inflammation hypothesis". Circulation. 106 (1): 136–40. doi:10.1161/01.CIR.0000021112.29409.A2. PMID 12093783. Archived from the original on 2007-03-11. Retrieved 2006-04-01. ^ Griffin M, Frazer A, Johnson A, Collins P, Owens D, Tomkin GH (June 1998). "Cellular cholesterol synthesis--the relationship to post-prandial glucose and insulin following weight loss". Atherosclerosis. 138 (2): 313–8. doi:10.1016/S0021-9150(98)00036-7. PMID 9690914. ^ King CR, Knutson KL, Rathouz PJ, Sidney S, Liu K, Lauderdale DS (December 2008). "Short sleep duration and incident coronary artery calcification". JAMA. 300 (24): 2859–66. doi:10.1001/jama.2008.867. PMC 2661105. PMID 19109114. ^ Provost EB, Madhloum N, Int Panis L, De Boever P, Nawrot TS (2015). "Carotid intima-media thickness, a marker of subclinical atherosclerosis, and particulate air pollution exposure: the meta-analytical evidence". PLOS One. 10 (5): e0127014. doi:10.1371/journal.pone.0127014. PMC 4430520. PMID 25970426. ^ Adar SD, Sheppard L, Vedal S, Polak JF, Sampson PD, Diez Roux AV, Budoff M, Jacobs DR, Barr RG, Watson K, Kaufman JD (April 23, 2013). "Fine particulate air pollution and the progression of carotid intima-medial thickness: a prospective cohort study from the multi-ethnic study of atherosclerosis and air pollution". PLoS Medicine. 10 (4): e1001430. doi:10.1371/journal.pmed.1001430. PMC 3637008. PMID 23637576. This early analysis from MESA suggests that higher long-term PM2.5 concentrations are associated with increased IMT progression and that greater reductions in PM2.5 are related to slower IMT progression. ^ Chih-Hao Wang. "Biological Gradient Between Long-Term Arsenic Exposure and Carotid Atherosclerosis". ahajournals.org. ^ "Treating Hypothyroidism Reduces Atherosclerosis Risk". American Family Physician. 69 (3). 1 February 2004. ISSN 0002-838X. ^ Bale BF, Doneen AL, Vigerust DJ (April 2017). "High-risk periodontal pathogens contribute to the pathogenesis of atherosclerosis". Postgraduate Medical Journal. 93 (1098): 215–220. doi:10.1136/postgradmedj-2016-134279. PMC 5520251. PMID 27899684. ^ Taubes G (March 2001). "Nutrition. The soft science of dietary fat". Science. 291 (5513): 2536–45. doi:10.1126/science.291.5513.2536. PMID 11286266. ^ "Food Pyramids: Nutrition Source, Harvard School of Public Health". Archived from the original on 26 December 2007. Retrieved 2007-11-25. ^ Song JH, Fujimoto K, Miyazawa T (December 2000). "Polyunsaturated (n-3) fatty acids susceptible to peroxidation are increased in plasma and tissue lipids of rats fed docosahexaenoic acid-containing oils". The Journal of Nutrition. 130 (12): 3028–33. doi:10.1093/jn/130.12.3028. PMID 11110863. ^ Yap SC, Choo YM, Hew NF, Yap SF, Khor HT, Ong AS, Goh SH (December 1995). "Oxidative susceptibility of low density lipoprotein from rabbits fed atherogenic diets containing coconut, palm, or soybean oils". Lipids. 30 (12): 1145–50. doi:10.1007/BF02536616. PMID 8614305. ^ Greco AV, Mingrone G (1990). "Serum and biliary lipid pattern in rabbits feeding a diet enriched with unsaturated fatty acids". Experimental Pathology. 40 (1): 19–33. doi:10.1016/S0232-1513(11)80281-1. PMID 2279534. ^ "Scientist, 98, challenges orthodoxy on causes of heart disease". medicalxpress.com. ^ Dobarganes C, Márquez-Ruiz G (March 2003). "Oxidized fats in foods". Current Opinion in Clinical Nutrition and Metabolic Care. 6 (2): 157–63. doi:10.1097/00075197-200303000-00004. PMID 12589185. ^ supplements, FDA. "Dietary Supplements". ^ Schwartz CJ, Valente AJ, Sprague EA, Kelley JL, Cayatte AJ, Mowery J (December 1992). "Atherosclerosis. Potential targets for stabilization and regression". Circulation. 86 (6 Suppl): III117–23. PMID 1424045. ^ Robbins CS, Hilgendorf I, Weber GF, Theurl I, Iwamoto Y, Figueiredo JL, Gorbatov R, Sukhova GK, Gerhardt LM, Smyth D, Zavitz CC, Shikatani EA, Parsons M, van Rooijen N, Lin HY, Husain M, Libby P, Nahrendorf M, Weissleder R, Swirski FK (September 2013). "Local proliferation dominates lesional macrophage accumulation in atherosclerosis". Nature Medicine. 19 (9): 1166–72. doi:10.1038/nm.3258. PMC 3769444. PMID 23933982. ^ Miller JD (June 2013). "Cardiovascular calcification: Orbicular origins". Nature Materials. 12 (6): 476–8. Bibcode:2013NatMa..12..476M. doi:10.1038/nmat3663. PMID 23695741. ^ Glagov S, Weisenberg E, Zarins CK, Stankunavicius R, Kolettis GJ (May 1987). "Compensatory enlargement of human atherosclerotic coronary arteries". The New England Journal of Medicine. 316 (22): 1371–5. doi:10.1056/NEJM198705283162204. PMID 3574413. ^ "Coronary atherosclerosis — the fibrous plaque with calcification". www.pathologyatlas.ro. Retrieved 2010-03-25. ^ Maton, Anthea; Roshan L. Jean Hopkins; Charles William McLaughlin; Susan Johnson; Maryanna Quon Warner; David LaHart; Jill D. Wright (1993). Human Biology and Health. Englewood Cliffs, NJ: Prentice Hall. ISBN 978-0-13-981176-0. OCLC 32308337. ^ Wang J, Michelitsch T, Wunderlin A, Mahadeva R (2009). "Aging as a consequence of Misrepair –a novel theory of aging". 0904 (575). arXiv:0904.0575. Bibcode:2009arXiv0904.0575W. ^ Wang-Michelitsch J, Michelitsch T (2015). "Aging as a process of accumulation of Misrepairs". 1503 (7163). arXiv:1503.07163. Bibcode:2015arXiv150307163W. ^ Wang-Michelitsch J, Michelitsch T (2015). "Misrepair mechanism in the development of atherosclerotic plaques". 1505 (1289). arXiv:1505.01289. Bibcode:2015arXiv150501289W. ^ Ross R (January 1999). "Atherosclerosis--an inflammatory disease". The New England Journal of Medicine. 340 (2): 115–26. doi:10.1056/NEJM199901143400207. PMID 9887164. ^ Finn AV, Nakano M, Narula J, Kolodgie FD, Virmani R (July 2010). "Concept of vulnerable/unstable plaque". Arteriosclerosis, Thrombosis, and Vascular Biology. 30 (7): 1282–92. doi:10.1161/ATVBAHA.108.179739. PMID 20554950. ^ Didangelos A, Simper D, Monaco C, Mayr M (May 2009). "Proteomics of acute coronary syndromes". Current Atherosclerosis Reports. 11 (3): 188–95. doi:10.1007/s11883-009-0030-x. PMID 19361350. ^ Maseri A, Fuster V (April 2003). "Is there a vulnerable plaque?". Circulation. 107 (16): 2068–71. doi:10.1161/01.CIR.0000070585.48035.D1. PMID 12719286. ^ McNeal CJ, Dajani T, Wilson D, Cassidy-Bushrow AE, Dickerson JB, Ory M (January 2010). "Hypercholesterolemia in youth: opportunities and obstacles to prevent premature atherosclerotic cardiovascular disease". Current Atherosclerosis Reports. 12 (1): 20–8. doi:10.1007/s11883-009-0072-0. PMID 20425267. ^ Rice BH (2014). "Dairy and Cardiovascular Disease: A Review of Recent Observational Research". Current Nutrition Reports. 3 (2): 130–138. doi:10.1007/s13668-014-0076-4. PMC 4006120. PMID 24818071. ^ Kratz M, Baars T, Guyenet S (February 2013). "The relationship between high-fat dairy consumption and obesity, cardiovascular, and metabolic disease". European Journal of Nutrition. 52 (1): 1–24. doi:10.1007/s00394-012-0418-1. PMID 22810464. ^ Walker C, Reamy BV (April 2009). "Diets for cardiovascular disease prevention: what is the evidence?". American Family Physician. 79 (7): 571–8. PMID 19378874. ^ Nordmann AJ, Suter-Zimmermann K, Bucher HC, Shai I, Tuttle KR, Estruch R, Briel M (September 2011). "Meta-analysis comparing Mediterranean to low-fat diets for modification of cardiovascular risk factors". The American Journal of Medicine. 124 (9): 841–51.e2. doi:10.1016/j.amjmed.2011.04.024. PMID 21854893. ^ "Unit 6: Cardiovascular, Circulatory, and Hematologic Function." Suzane C. Smeltzer, Brenda G. Bare, Janice L Hinkle, Kerry K Cheever. Brunner & Suddarth's Textbook of Medical-Surgical Nursing. Philadelphia: Lippincott Williams & Wilkins, 2010. 682-900. Textbook. ^ a b Fonarow G (2003). "Aggressive treatment of atherosclerosis: The time is now". Cleve. Clin. J. Med. 70 (5): 431–434. doi:10.3949/ccjm.70.5.431. ^ Ambrose JA, Barua RS (May 2004). "The pathophysiology of cigarette smoking and cardiovascular disease: an update". Journal of the American College of Cardiology. 43 (10): 1731–7. doi:10.1016/j.jacc.2003.12.047. PMID 15145091. ^ Pigozzi F, et al. (2011). "Endothelial (dys)function: the target of physical exercise for prevention and treatment of cardiovascular disease". J. Sports Med. Phys. Fitness. 51: 260–267. ^ Koh KK, Han SH, Oh PC, Shin EK, Quon MJ (April 2010). "Combination therapy for treatment or prevention of atherosclerosis: focus on the lipid-RAAS interaction". Atherosclerosis. 209 (2): 307–13. doi:10.1016/j.atherosclerosis.2009.09.007. PMC 2962413. PMID 19800624. ^ Taylor F, Huffman MD, Macedo AF, Moore TH, Burke M, Davey Smith G, Ward K, Ebrahim S (January 2013). "Statins for the primary prevention of cardiovascular disease". The Cochrane Database of Systematic Reviews. 1 (1): CD004816. doi:10.1002/14651858.CD004816.pub5. PMC 4164175. PMID 23440795. ^ Vos E, Rose CP (November 2005). "Questioning the benefits of statins". CMAJ. 173 (10): 1207, author reply 1210. doi:10.1503/cmaj.1050120. PMC 1277053. PMID 16275976. ^ Zhao DF, Edelman JJ, Seco M, Bannon PG, Wilson MK, Byrom MJ, Thourani V, Lamy A, Taggart DP, Puskas JD, Vallely MP (February 2017). "Coronary Artery Bypass Grafting With and Without Manipulation of the Ascending Aorta: A Network Meta-Analysis". Journal of the American College of Cardiology. 69 (8): 924–936. doi:10.1016/j.jacc.2016.11.071. PMID 28231944. ^ Price PA, Faus SA, Williamson MK (February 2000). "Warfarin-induced artery calcification is accelerated by growth and vitamin D". Arteriosclerosis, Thrombosis, and Vascular Biology. 20 (2): 317–27. doi:10.1161/01.ATV.20.2.317. PMID 10669626. ^ Geleijnse JM, Vermeer C, Grobbee DE, Schurgers LJ, Knapen MH, van der Meer IM, Hofman A, Witteman JC (November 2004). "Dietary intake of menaquinone is associated with a reduced risk of coronary heart disease: the Rotterdam Study". The Journal of Nutrition. 134 (11): 3100–5. doi:10.1093/jn/134.11.3100. PMID 15514282. ^ "Linus Pauling Institute at Oregon State University". lpi.oregonstate.edu. Archived from the original on 7 April 2010. Retrieved 2010-03-25. ^ Barter PJ, Caulfield M, Eriksson M, Grundy SM, Kastelein JJ, Komajda M, Lopez-Sendon J, Mosca L, Tardif JC, Waters DD, Shear CL, Revkin JH, Buhr KA, Fisher MR, Tall AR, Brewer B (November 2007). "Effects of torcetrapib in patients at high risk for coronary events". The New England Journal of Medicine. 357 (21): 2109–22. doi:10.1056/NEJMoa0706628. PMID 17984165. ^ Nilsson J, Hansson GK, Shah PK (January 2005). "Immunomodulation of atherosclerosis: implications for vaccine development". Arteriosclerosis, Thrombosis, and Vascular Biology. 25 (1): 18–28. doi:10.1161/01.ATV.0000149142.42590.a2. PMID 15514204. Archived from the original on 2007-12-14. Retrieved 2007-11-14. ^ Spiteller G (November 2005). "The relation of lipid peroxidation processes with atherogenesis: a new theory on atherogenesis". Molecular Nutrition & Food Research. 49 (11): 999–1013. doi:10.1002/mnfr.200500055. PMID 16270286. ^ Berbée JF, Mol IM, Milne GL, Pollock E, Hoeke G, Lütjohann D, Monaco C, Rensen PC, van der Ploeg LH, Shchepinov MS (September 2017). "Deuterium-reinforced polyunsaturated fatty acids protect against atherosclerosis by lowering lipid peroxidation and hypercholesterolemia". Atherosclerosis. 264: 100–107. doi:10.1016/j.atherosclerosis.2017.06.916. PMID 28655430. ^ Tsikas D (September 2017). "Combating atherosclerosis with heavy PUFAs: Deuteron not proton is the first". Atherosclerosis. 264: 79–82. doi:10.1016/j.atherosclerosis.2017.07.018. PMID 28756876. ^ a b Chen WJ, Yin K, Zhao GJ, Fu YC, Tang CK (June 2012). "The magic and mystery of microRNA-27 in atherosclerosis". Atherosclerosis. 222 (2): 314–23. doi:10.1016/j.atherosclerosis.2012.01.020. PMID 22307089. ^ Sacco J, Adeli K (June 2012). "MicroRNAs: emerging roles in lipid and lipoprotein metabolism". Current Opinion in Lipidology. 23 (3): 220–5. doi:10.1097/MOL.0b013e3283534c9f. PMID 22488426. ^ Bommer GT, MacDougald OA (March 2011). "Regulation of lipid homeostasis by the bifunctional SREBF2-miR33a locus". Cell Metabolism. 13 (3): 241–7. doi:10.1016/j.cmet.2011.02.004. PMC 3062104. PMID 21356514. ^ Rayner KJ, Sheedy FJ, Esau CC, Hussain FN, Temel RE, Parathath S, van Gils JM, Rayner AJ, Chang AN, Suarez Y, Fernandez-Hernando C, Fisher EA, Moore KJ (July 2011). "Antagonism of miR-33 in mice promotes reverse cholesterol transport and regression of atherosclerosis". The Journal of Clinical Investigation. 121 (7): 2921–31. doi:10.1172/JCI57275. PMC 3223840. PMID 21646721. ^ Iwakiri Y (March 2012). "A role of miR-33 for cell cycle progression and cell proliferation". Cell Cycle (Georgetown, Tex.). 11 (6): 1057–8. doi:10.4161/cc.11.6.19744. PMID 22395363. ^ Singaraja RR, Stahmer B, Brundert M, Merkel M, Heeren J, Bissada N, Kang M, Timmins JM, Ramakrishnan R, Parks JS, Hayden MR, Rinninger F (August 2006). "Hepatic ATP-binding cassette transporter A1 is a key molecule in high-density lipoprotein cholesteryl ester metabolism in mice". Arteriosclerosis, Thrombosis, and Vascular Biology. 26 (8): 1821–7. doi:10.1161/01.ATV.0000229219.13757.a2. PMID 16728652. ^ Zimmer S, Grebe A, Bakke SS, Bode N, Halvorsen B, Ulas T, Skjelland M, De Nardo D, Labzin LI, Kerksiek A, Hempel C, Heneka MT, Hawxhurst V, Fitzgerald ML, Trebicka J, Björkhem I, Gustafsson JÅ, Westerterp M, Tall AR, Wright SD, Espevik T, Schultze JL, Nickenig G, Lütjohann D, Latz E (April 2016). "Cyclodextrin promotes atherosclerosis regression via macrophage reprogramming". Science Translational Medicine. 8 (333): 333ra50. doi:10.1126/scitranslmed.aad6100. PMC 4878149. PMID 27053774. Lay summary – Science News. ^ Wu H, Roks AJ (February 2014). "Genomic instability and vascular aging: a focus on nucleotide excision repair". Trends in Cardiovascular Medicine. 24 (2): 61–8. doi:10.1016/j.tcm.2013.06.005. PMID 23953979. ^ a b Bautista-Niño PK, Portilla-Fernandez E, Vaughan DE, Danser AH, Roks AJ (May 2016). "DNA Damage: A Main Determinant of Vascular Aging". International Journal of Molecular Sciences. 17 (5): 748. doi:10.3390/ijms17050748. PMC 4881569. PMID 27213333. ^ Shah AV, Bennett MR (December 2017). "DNA damage-dependent mechanisms of ageing and disease in the macro- and microvasculature". European Journal of Pharmacology. 816: 116–128. doi:10.1016/j.ejphar.2017.03.050. PMID 28347738. ^ a b Martinet W, Knaapen MW, De Meyer GR, Herman AG, Kockx MM (August 2002). "Elevated levels of oxidative DNA damage and DNA repair enzymes in human atherosclerotic plaques". Circulation. 106 (8): 927–32. doi:10.1161/01.cir.0000026393.47805.21. PMID 12186795. ^ Ishida T, Ishida M, Tashiro S, Yoshizumi M, Kihara Y (2014). "Role of DNA damage in cardiovascular disease". Circulation Journal. 78 (1): 42–50. doi:10.1253/circj.CJ-13-1194. PMID 24334614. ^ a b Barrington WT, Lusis AJ (December 2017). "Atherosclerosis: Association between the gut microbiome and atherosclerosis". Nature Reviews. Cardiology. 14 (12): 699–700. doi:10.1038/nrcardio.2017.169. PMC 5815826. PMID 29099096. ^ Jie Z, Xia H, Zhong SL, Feng Q, Li S, Liang S, et al. (October 2017). "The gut microbiome in atherosclerotic cardiovascular disease". Nature Communications. 8 (1): 845. doi:10.1038/s41467-017-00900-1. PMC 5635030. PMID 29018189. Wikimedia Commons has media related to Atherosclerosis.